CHANEL ROUGE COCO SHINE in Aventure is a rosy pink lipstick with gold flecks throughout. It is semi-sheer but deposits enough color that even though it looks like a bright pink lipstick, it comes off as a muted toned down pink. Some have called it "MLBB - my lips but better" kind of color if that helps. Anyway, I"m slowly trying to build up my Chanel makeup collection and one of my "Must Have" items for this brand is their line of Rouge Coco Shine lipsticks. I bought my first Rouge Coco shine last year around the beginning of Summer and it was the online exclusive Royallieu. Normally I hate lipstick and wouldn't dream of spending so much money on them, but the Chanel Rouge Coco shines are so much better than your ordinary tube of lipstick. The Rouge Coco Shine lipsticks don't dry out my lips and they don't end up all over my teeth either, which is really disgusting. In fact they are quite moisturizing. and in my opinion, the Rouge Coco Shine lipsticks are a combination of both a lipgloss and lipstick because they go on smooth and semi-glossy like a lipgloss, but have the staying power of a lipstick. Now it is important to note that some people have stated that the staying power of these is less than stellar. However, I have found them to be long lasting when I do the following: I apply the Rouge Coco shine once, wait a few minutes, and then I reapply. Once I have done that, I apply a light gloss to set the lipstick, but not too much or it will ruin the overall look of the lip and can be quite messy as well. 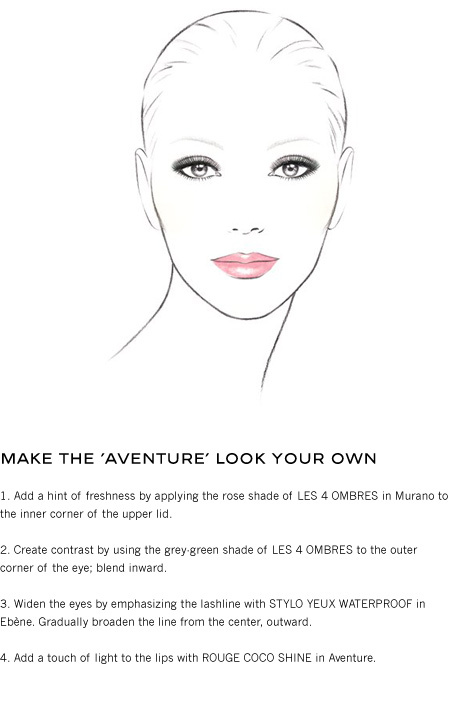 The face chart below is a look that I found on the Chanel website that can be used as a guide when trying to create a look using the Chanel Rouge Coco shine in Aventure.